The following article by Eric Roper was published on http://startribune.com/ on August 1, 2014. Cost, Vikings use drive a debate over control of downtown park. 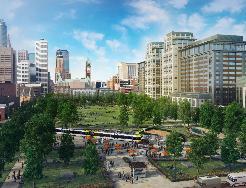 Months after a lawsuit foisted the proposed proposed downtown park into the hands of park officials, the Minneapolis Park Board is preparing to say it wants nothing to do with the development. The Park Board will debate a measure next week that says it is not able to oversee “the Yard” adjoining the new Vikings stadium because of its high cost and considerable usage by the Vikings and the Metropolitan Sports Facilities Authority. An agreement signed in February limits public use of the space, giving the team and the authority control of the two-block urban park for up to 80 days a year. Additionally, Wielinski said, they anticipate the cost of the park to reach $20 million. One of the major funding sources — air rights above a nearby parking ramp — is in jeopardy after plans fell through to build a hotel. Park officials expect the cost of operations and maintenance to approach $3 million a year, a hefty sum for the cash-strapped agency. “When the air rights deal fell apart, it made everybody even more cautious about getting into something that could be very expensive,” Wielinski said. Minneapolis’ independent Park Board had to take over the City Hall-led project when a district judge ruled that city officials lack jurisdiction to create city parks. Some had then advocated that the Park Board own the land but leasing out operations and maintenance to a nonprofit conservancy. City Council Member Jacob Frey, who represents the area, said the resolution adds support for the conservancy idea, though he was not sure who precisely would own the land. Perhaps a more pressing concern, however, is finding the money to build the park. Frey said it is expected to be built in two phases: a basic park to coincide with the completion of surrounding developments and a more complex park to be built after that. “We need to be raising capital for the final vision up front, now,” Frey said, adding he does not know what the final cost will be. The Park Board will debate the resolution at its meeting on Wednesday. Wielinski said several commissioners are leery about the future of the park, though she is aware of one that would like the Park Board to retain control. This entry was posted in Downtown East Park on August 2, 2014 by citoyen1789.